At 8:37 pm EDT on May 1, 2012, Venus was 2 degrees from Alnath (Beta Tauri, the northern horn tip of Taurus) and about 3½ degrees from where it will be stationary on May 15th (above-left of Alnath). Zeta Tauri, the southern horn tip, is to the left of Alnath (move your mouse cursor over the image too see labels). 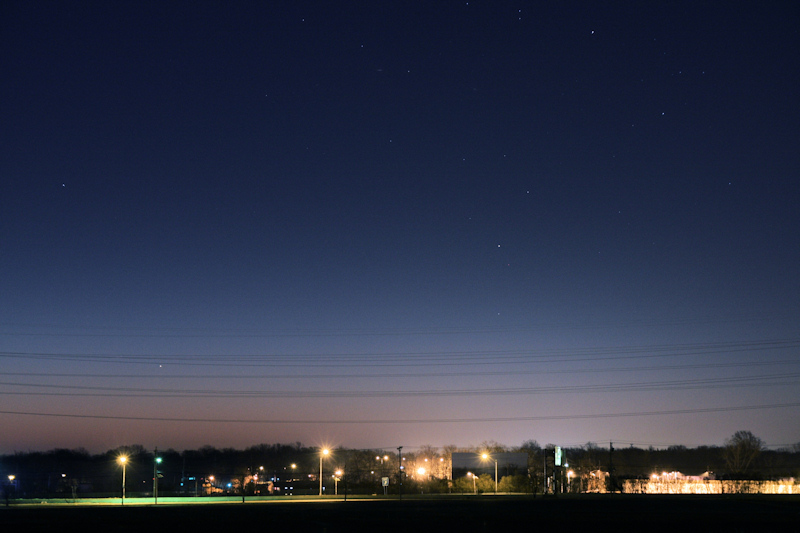 Taken from Delran, NJ (looking towards Philadelphia), with a Canon 40D digital SLR camera (handheld, but braced against a pole) and a Sigma 18-50 mm f/2.8 zoom lens at 29 mm focal length, then cropped a little. Exposed 1 second at f/2.8, ISO 800. After May 15th, Venus will be in retrograde motion as it plunges back towards the sun and the Transit on June 5th, 2012 (starting just after 6 pm EDT). Here's the view at 8:28 pm EDT on April 25, 2012, the moon has moved eastward compared to yesterday's picture, so it's now above-left of Venus in the still bright evening twilight. Taken with a Canon 40D digital SLR camera (on a fixed tripod) and a Sigma 30 mm f/1.4 lens (30 mm would be a "normal" lens for the APS-C size sensor in the 40D). Exposed 0.7 seconds at f/4, ISO 400. Continuing the monthly cycle for 2012, the crescent moon was near Venus again in the western sky after sunset. When this picture was taken at 9:34 pm EDT on April 24, 2012, the moon was 3.8 days old and 12% illuminated (although the illumination looks greater because it's overexposed and somewhat blurred by clouds in this view; see the next picture for a close-up with less cloudiness). Venus was also a crescent, 32% illuminated (move your mouse cursor over the picture to see labels). Taken with a Canon 40D digital SLR camera (on a fixed tripod) with a Sigma 30 mm f/1.4 lens; exposed 1.5 seconds at f/3.5, ISO 400. Here's the moon and Venus at 9:12 pm EDT on April 24, 2012, when they were 6.3 degrees apart. Taken with a Canon 40D digital SLR camera and a Canon 70-200 mm f/2.8L zoom lens (on a fixed tripod) at 100 mm focal length. Exposed 1 second at f/4, ISO 400. On March 29, 2012, brilliant Venus was just 4.5 degrees below the bright open cluster, the Pleiades (also known as the Seven Sisters or M45). This image was captured from Maple Shade, NJ, at 8:38 pm EDT with a Canon 40D digital SLR camera (on a fixed tripod) and a Sigma 30 mm, f/1.4 lens (then cropped to an approximate 50 mm eqivalent). It was exposed 6 seconds at f/4, ISO 800, in a moderately bright, moonlit sky. The Pleiades are in the constellation Taurus the bull and mark his shoulder. Left of the Pleiades is the V-shaped pattern of the Hyades star cluster marking the face of the bull. Aldebaran is the first magnitude star at the upper left of the V. Move your mouse cursor over the image for a close-up crop of Venus and the Pleiades. Scroll down for an image taken on April 2nd when they were closer together. Click here for a SkyTools chart of Venus' position from April 1st to 5th, 2012. On April 2, 2012, brilliant Venus had moved to the southern edge of the Pleiades. This image was captured from Carranza Field in Wharton State Forest under a bright gibbous moon at 8:11 pm EDT with a Canon 40D digital SLR camera (on a fixed tripod) and a Sigma 18-50 mm f/2.8 zoom lens at 50 mm focal length. Exposed 4 seconds at f/4, ISO 800. Move your mouse cursor over the image for a close-up crop of Venus and the Pleiades. 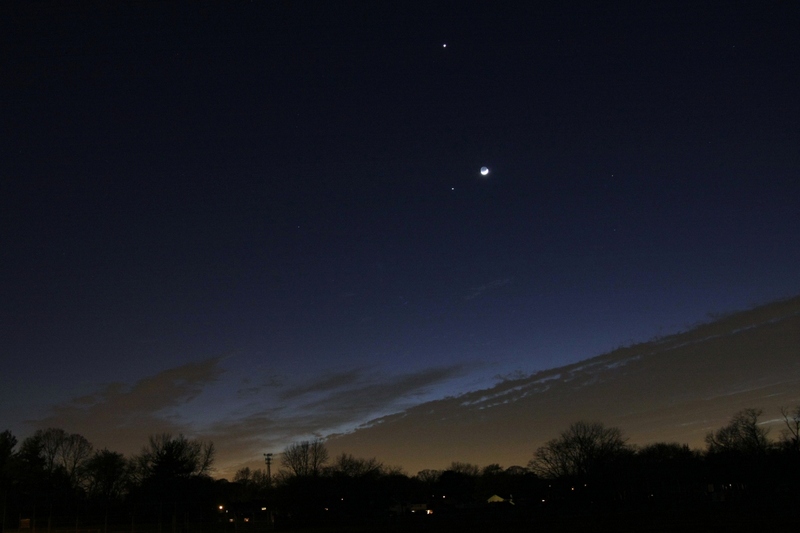 On Sunday evening, March 25, 2012, the crescent moon joined Venus and Jupiter. The crescent moon is next to Jupiter at the base of the narrow triangle with Venus at the upper apex. Taken at 8:09 pm EDT from Maple Shade, NJ, with a Canon 40D digital SLR camera (on a fixed tripod) and a Sigma 18-50 mm f/2.8 zoom lens at 18 mm focal length. Exposed 1 second at f/3.5, ISO 400. Both of the images below were taken at 8:22 pm EDT, the left one on Sunday, March 25, 2012 (from Maple Shade, NJ), and the right one on Monday, March 26, 2012 (from Delran NJ). On Sunday, the 10% illuminated moon was next to Jupiter, about 9.5° below Venus. On Monday, the 17% illuminated moon was next to Venus, about 12° above Jupiter. The camera in each case was a Canon 40D digital SLR on a fixed tripod. The left image was through a Canon 70-200 mm f/2.8L zoom lens at 70 mm, exposed 2 seconds at f/3.5, ISO 400. The right image was through a Sigma 18-50 mm f/2.8 zoom lens at 50 mm (then cropped to 72% of the original linear dimensions), exposed 1.6 seconds at F/5.6, ISO 800. 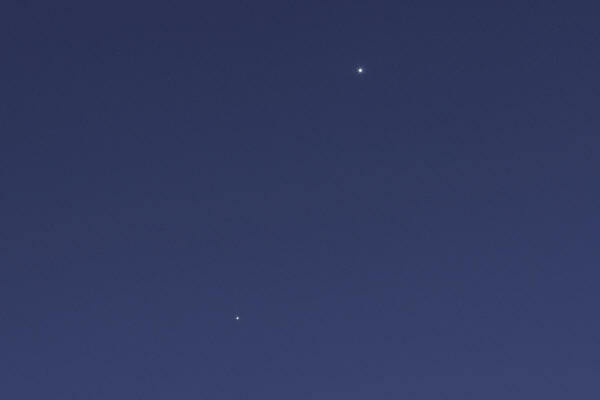 On the evening of March 17, 2012, the spacing between between Venus and Jupiter has increased to 4.5° and Venus is now above Jupiter after passing north of it (on the right) earlier this week. This picture was taken at 7:46 pm EDT, 37 minutes after sunset, from Maple Shade, NJ, with a Canon 40D digital SLR camera and a Canon 70-200 mm f/2.8L zoom lens (on a fixed tripod) set to 100 mm focal length. It was exposed 1/2 second at f/4, ISO 800. 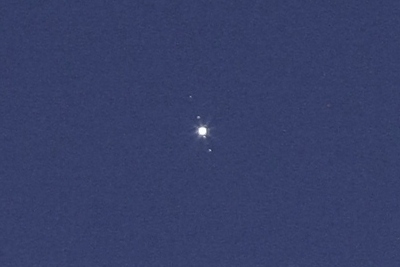 Look very carefully at Jupiter in the image above and you might see the four Galilean satellites. The picture below is a magnification of that area (cropped from the original image) and the satellites are readily apparent. Starting at the top, Callisto and Europa are above Jupiter, Io is just below it at the edge of the disc glare and Ganymede is at the bottom. The span from Callisto to Ganymede is about 11 arc minutes. Jupiter and Venus were just 3° apart on the day of their closest approach, March 13, 2012, two days before geocentric conjunction in right ascension. Here's a view of them 7.5° above Northeast Philadelphia (at that low altitude, atmospheric absorption takes a toll on their brightness compared to the next image that was acquired two days and a couple of hours earlier). This picture was taken from the parking lot of the Riverton Yacht Club on the eastern shore of the Delaware River at 10:11 pm EDT with a Canon 40D digital SLR camera (on a fixed tripod) and a Sigma 18-50 mm f/2.8 zoom lens set to 18 mm focal length. Exposed 4 seconds at f/5.6, ISO 400. 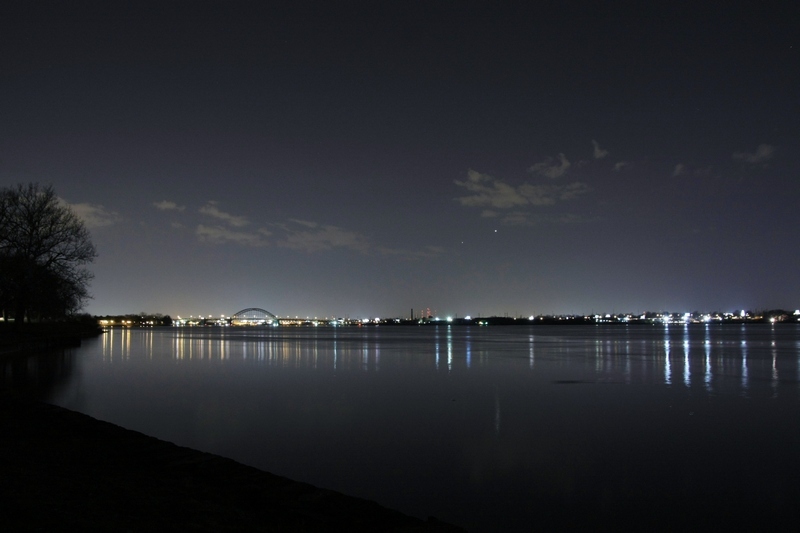 Jupiter and Venus were just 3°26' apart, and about 27° altitude, when this image of the pair was captured on March 11, 2012, as they hovered over the Tacony-Palmyra Bridge connecting Northeast Philadelphia with Palmyra, New Jersey. Jupiter is on the left at magnitude -2.1 and Venus is on the right at magnitude -4.4 (about 8 times brighter than Jupiter). This picture was taken at 8:31 pm EDT (3 minutes before the end of astronomical twilight) with a Canon 40D digital SLR camera (on a fixed tripod) and a Sigma 18-50 mm f/2.8 zoom lens set to 18 mm focal length. Exposed 2 seconds at f/4.0, ISO 400. After sunset on February 25, 2012, three of the brightest objects in the night sky formed an attractive slender triangle through gaps in the clouds. Jupiter is at the upper apex while Venus is 16° below it at the lower left. This image was captured from my neighbor's back yard in Maple Shade, NJ, at 6:23 pm EST (36 minutes after sunset) with a Canon 40D digital SLR camera and a Sigma 18-50 mm f/2.8 zoom lens set to 18 mm focal length. Exposed 1/6 second (handheld) at f/2.8, ISO 800. On Sunday evening, February 26, 2012, the two planets were 15° apart, the moon had moved close to Jupiter and there was now a clear blue sky. This image was captured from Carranza Field at 6:24 pm EST with a Canon 40D (on a fixed tripod) with a Sigma 18-50 mm f/2.8 zoom lens set to 50 mm focal length (then cropped a little vertically). It was exposed 1/2 second at f/2.8, ISO 400. Also on Sunday evening, February 26th, the planet Mercury was low on the horizon after sunset as it moves towards its first (eastern) elongation of the year on March 5th. As pictured here, it's at 7° altitude, a little right of center in the pale blue band of twilight. Move your mouse cursor over the image to zoom in on Mercury. Captured at 6:25 pm with the same hardware as the image above. It was exposed 1/8 second at f/2.8, ISO 400. On the night of February 9, 2012, the planets Uranus and Venus reach conjunction around midnight. When this picture was taken at 6:34 pm that evening from Maple Shade, NJ, they were a third of degree apart, 26 degrees altitude and would set at 8:55 pm. Venus blazes brilliantly at magnitude -4.1, while Uranus at magnitude +5.9 is 10,000 times dimmer (it would be just visible to the unaided eye under ideal conditions). This image was captured with a Canon 40D digital SLR camera at the prime focus of an 80 mm, f/6 apochromatic refractor on a fixed tripod. It was exposed 0.6 seconds at ISO 1600. Besides size reduction, no processing was applied. On the evening of January 27, 2012, Jupiter and Venus were about 45 degrees apart in the western sky at the end of twilight. Jupiter is at the top left corner, the Crescent Moon is right of center (but greatly overexposed, so the crescent is washed out) and Venus is above the tree tops. Taken at 7:03 pm EST from the baseball field complex in Maple Shade, NJ, with a Canon 40D digital SLR camera (on a fixed tripod) and a Sigma 18-50 mm f/2.8 zoom lens set to 18 mm focal length. It was exposed 3.2 seconds at f/4, ISO 400. Click here for a larger version. Click here for a larger annotated version. However, Jupiter and Venus weren't the only planets in the field of view, Uranus was just 5.25 degrees below left of the Moon, but at magnitude 5.9, too faint to see in the picture above. However, it can be seen in the picture below, taken with the same setup, but exposed 6 seconds at 50 mm focal length (then cropped). Move your mouse cursor over the picture to reveal its label. Also labeled with their Flamsteed numbers are four 5th magnitude stars in Pisces that I have used since last summer as a guide to finding Uranus with binoculars or a scope. The eastern portion of the Circlet of Pisces is below right of the Moon; the reddish object at the upper left of the Circlet is the carbon star 19 (or TX) Piscium. I went out to photograph the close pairing of Jupiter and the gibbous moon on the evening of January 2, 2012, and was greeted by broken clouds. However, by being patient and waiting for the right moment, I was able to use the clouds to temper the brightness of the moon so it wasn't washed out while allowing enough exposure for Jupiter. Taken at 10:47 pm EST from Maple Shade, New Jersey, using a Canon 40D digital SLR camera and a Canon 70-200 mm f/2.8L zoom lens on a fixed tripod set to 120 mm focal length. Exposed 1.6 seconds at f/5.6, ISO 800. Jupiter and the moon were less than 5 degrees apart at the time, and were at geocentric conjunction in right ascension about an hour earlier at 9:48 pm EST on January 2, 2012. Click the image for a larger version. At 6:02 am on January 1, 2012, Mercury was spotted from the old Pennsauken Mart site in New Jersey with 10x42 binoculars when it was at a mere 1 degree altitude, but soon after, it was easily visible to the unaided eye. This image was captured at 6:15 am EST, 67 minutes before sunrise when Mercury was at 3.3 degrees altitude, using a Canon 40D digital SLR camera (on a fixed tripod) with a Sigma 18 to 50 mm f/2.8 zoom lens set to 50 mm focal length. It was exposed 3.2 seconds at f/4, ISO 400, auto white balance (although later adjusted with Corel Paint Shop Pro X2). Mercury is in Ophiuchus, just east of Scorpius. Mouseover for labels.